The Edithorial: WHOSE COLLEGE IS IT ANYWAY? WHOSE COLLEGE IS IT ANYWAY? In an article published in today’s Observer the Royal Holloway spokesperson Helen Coleman repeats the tired old disparagements of the performance of the Classics Department at Royal Holloway that her office has been churning out for months. Never mind that most of the allegations have been shown to be based on false data. The really staggering point is that the people appointed to ‘manage’ the College think that it behoves them to slag off the College in the national press. But who or what is ‘the College’? It surely consists of academics and students: its 1985 charter states the objects of the College shall be ‘to promote for the public good education and scholarship’ and ‘to provide instruction leading to degrees of the university, to superintend postgraduate studies and to promote research’. This certainly assumes that ‘the College’ must consist of the people engaged in education and research, which means teachers and students. University leaders used to be distinguished academics who fought for, rather than against, their co-lecturers and students. They also used to have sufficient courage of their convictions and respect for the work done by their fellow scholars to speak to the public for themselves without employing ‘Directors of Communication’. 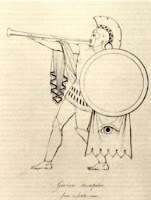 In ancient Greece, both tyrants and democratic city-states used heralds as their spokespersons. A successful career as a herald required sacrificing to Hermes (the herald of Zeus), an extremely loud voice and ownership of a trumpet. You could actually compete in the Panhellenic games in heraldry, where the sole criterion seems to be the number of decibels you could produce! Tyrants used their heralds to deliver oppressive messages. 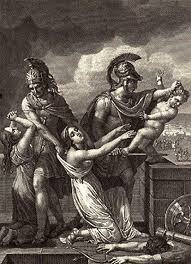 The herald Talthybius is ordered by the Greek elite to tell Andromache to hand over her baby son to be thrown from the walls of Troy. 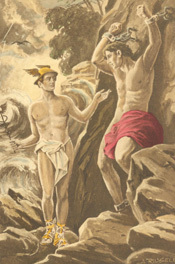 A nauseatingly sycophantic Hermes is sent by Zeus to try to get Prometheus, being tortured on his rock, to submit to the supreme god’s dictatorship. But no ancient Greek democracy would ever dream of hiring a herald to criticise its own work and achievements at the top of his voice to the rest of the world. At the end of the fifth century BCE, Athens was enduring the reign of terror of the so-called Thirty Tyrants. The prominent democrats of Athens asked their spokesman, the herald Cleocritus, to address these opportunistic aristocrats. He said, ‘Fellow citizens, why are you keeping us out of Athens? Why do you seek our deaths? For we have never done you any harm. We have taken part alongside you in the most hallowed rituals and sacrifices, and in the finest festivals. We have been your co-dancers in choruses and co-students, as well as your co-soldiers. We have been in dangerous situations with you on both land and sea in defence of our mutual security and freedom.’ It would be good to see the Royal Holloway spokesperson sounding more like Cleocritus and a bit less like Hermes in Prometheus Bound. You sound like a spoilt child who has thrown her toys out of the pram because people won't do what she wants. I imagine you want to protect your privileged life no matter what the pressures are on your former institution. Quite why you think you should have a right to dictate priorities, or to speak on the university's behalf is beyond me. You are not a good advertisement for HE.